Voters park to cast their ballots in Syracuse. (c) Rachel Day. 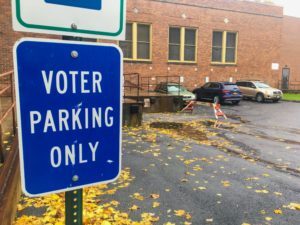 On a rainy morning at Elmwood School in Syracuse, New York, Southside voters trickled in to cast votes that will determine whether the ‘blue wave’ predictions are nothing more than polling inaccuracies. Throughout the weeks leading up to the midterm elections, polls have indicated that Democrats should be able to achieve a ‘blue wave,’ a term used for the party’s goal of taking back the House of Representatives majority with the potential to do the same in the Senate. In the New York 24th Congressional District, Democratic challenger Dana Balter was down 14 points in pre-election polls against Republican incumbent Rep. John Katko. But as the country saw in 2016, anything can happen at the polls. Samantha Whatley is a Syracuse resident who voted today in the hopes that Democrats will sweep the midterm elections. Samantha didn’t come alone to the polls. With her was her young son Nolan, who happily clutched Whatley’s “I Voted!” sticker as the two left the polls, hand in hand.